Keith Waithe [LRSM ] [ PGCEA] – is an award-winning flautist, composer, teacher, expert proponent of vocal gymnastics and leader of The Macusi Players. A world music Jazz band- blending rhythms from the Caribbean, South America, Asia and Africa. Keith mixes many sounds from his collection of over 200 flutes fusing enigmatic musical forms and world music resonances. In addition to working in radio, theatre and television Keith’s 8th Album “Gathering Echoes” and 9th Album “ THE VERY BEST OF KEITH WAITHE “ has had rave reviews. Amongst many others, Keith has worked with Nitin Sawhney, Courtney Pine and percussionist Bosco de Oliveira. 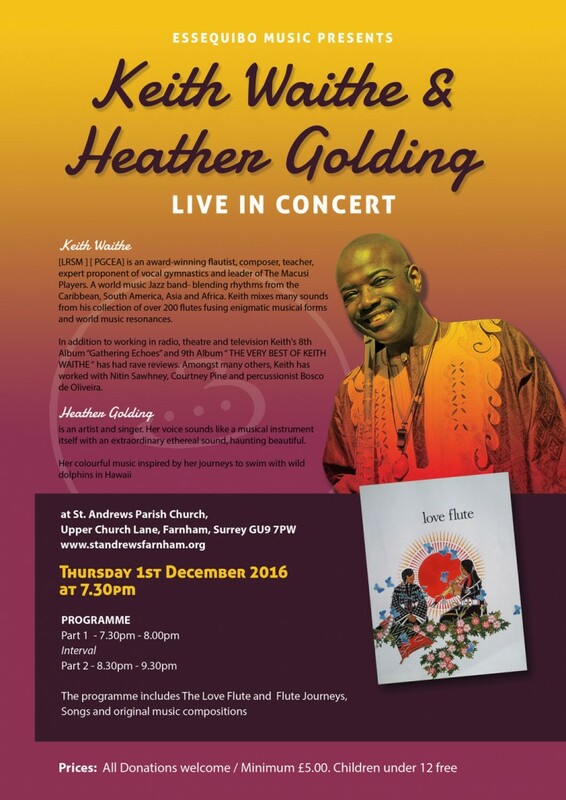 Heather Golding is an artist and singer. Her voice sounds like a musical instrument itself with an extraordinary ethereal sound, haunting beautiful. Her colourful music inspired by her journeys to swim with wild dolphins in Hawaii.